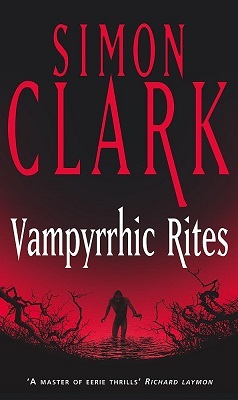 Vampyrrhic Rites is Simon Clark’s sequel to Vampyrrhic and picks up the story original story three years later. In the first book, four people joined together to fight and destroy the vampires. The four vampire slayers were David Leppington, Electra Charnwood, Bernice Mochardi and Jack Black. My favorite character, Jack Black, died fighting the vampire hoards, so I was not sure how much I would enjoy a sequel in which it seemed unlikely he would appear. I needn’t have worried. The big thug still manages to make himself useful this time around, despite the obvious disadvantage of being dead and dismembered and buried in more than one grave. Out of the three survivors, Electra is the only one who still remains in Leppington, where she continues to run the Station Hotel. Jack Black was probably the only man that Electra could ever have loved. She still mourns for him and has even named one of her hotel rooms after him. Electra has also set up a website called The Hotel Midnight, where she has documented the events that happened three years previously. The site includes a forum designed to help those who have had—or who might have—similar problems with vampires. Bernice has never returned to Leppington. She lives alone, in a small flat, along with the huge collection of boots and shoes that attest to the fact that has a shoe fetish. Lately though, Bernice has been feeling strangely unsettled with her life; so perhaps it is time she and her boots did some walking. David is working in a busy London Hospital. He has done his best to put the past behind him, but something strange happens on his thirtieth birthday: he has an unusual conversation with a dead man. Then David gets a second surprise when his schizophrenic ex-girlfriend, Katrina, suddenly walks back into his life to rekindle the embers of a love that never really died. Just as quickly as she appeared, Katrina vanishes again, leaving David with some very confused emotions and an awful lot of worry when he realizes that she has stopped taking her medication. Apart from the events of three years ago Electra, Bernice and David all share something else in common: they have all been having dreams about Jack Black. When a new breed of vampire turns up near a lake called Lazarus Deep, it becomes obvious Jack Black knows more about what’s going on than his friends do and is trying to help them from beyond the grave. The vampires in Vampyrrhic Rites live at the bottom of a lake, instead of underneath the town of Leppington. Like their predecessors though, they want David to lead their vampire army. They have also imprisoned a man, named Rowan. He’s in a house near the lake. Rowan is in a bad way, but he has been in constant touch with Electra, via her Hotel Midnight vampire website, and he wants her help. But is it a trap? Vampyrrhic Rites is 504 pages long and it’s a good read, but I must admit I much preferred the first book. Even though Jack Black still plays an important part this time around, he’s not the man he once was and—dare I say it?—he never really comes to life as a character. Jack is like a cardboard cut-out of the man he once was. In the first book, the reader got to see things from Jacks viewpoint. In Vampyrrhic Rites, readers only receive the other characters’ impressions of Jack. He never speaks and is a ghost of his former self in more ways than the one. There are a few new characters added to the mix. Two of which are a young man named Dylan Adams and a girl called Vicky Lawton. Dylan is an 18-year-old who lives in the small town of Morningdale, which is not very far from Leppington. Or Lazarus Deep, for that matter. Dylan is introduced early on in the book and when readers first meet him, he is standing beside Lazarus Deep, in the middle of the night. Dylan has the chance of a good job in London, and he wants to take it, but he has always had deep feelings for Vicky and is feeling a little confused. I suppose he would be just as confused at home in his bed—and warmer too—but hey, he’s young and in love. Dylan and Vicky are both important characters in the book and their developing relationship forms an interesting sub-plot. In fact, they turn up more frequently than Denise, who does not seem as important this time around, although she does have a crucial role to play in the final pages of the book. If you decide to read Vampyrrhic Rites, I would strongly recommend reading Vampyrhhic first because the original novel will give you a better understanding of the main characters, the history behind the vampires; and the reason for their connection with the Leppington family. Reading the first book will also give you the chance to appreciate what a strong character Jack Black was and just how, and where, he fits into the story.